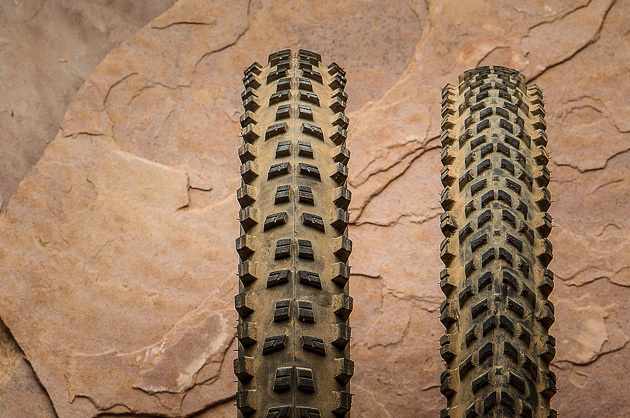 7 sought-after tires from Bontrager, Specialized, Continental, Schwalbe, Mavic, Maxxis, & WTB. Last year I wrote a review praising one of my favorite tires, the Continental Trail King 2.2 UST, and my love affair is still going strong. They're durable but not too heavy—780 grams for 26ers—have phenomenal wear characteristics and provide excellent traction in almost any condition. The secret is Continental's Black Chili rubber compound. Most of us know that harder rubber compounds last longer but don't grip well, and soft rubbers stick to the ground, but wear fast. Black Chili wears like hard rubber but grips like soft, so you don't have to choose between performance and longevity. The knobs on the Trail King are spaced out enough to shed mud, but not too much to sacrifice rolling speed. The side knobs are buttressed for cornering stability and siping increases the tire's bite.The sidewalls are tough, yet still offer a supple ride. While some squirm is detectable when cornering hard, the tire strikes a good balance between weight and rigidity. The two newest tires in Schwalbe's range are the Magic Mary and the Rock Razor, the former being a very chunky, intermediate tire and the latter being a fast-rolling semi-slick best suited to use as a rear tire. 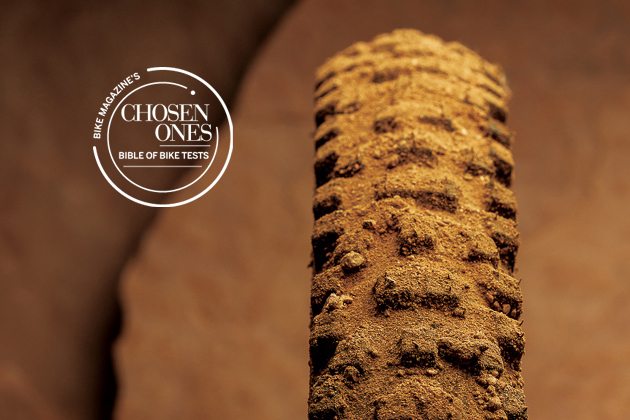 The Magic Mary tires look somewhat like cut mud-spikes. While we expected them to squirm a lot on the hardpack, rocky trails of Sedona we actually found them to be very confidence inspiring. They are unbeatable at digging into the soft sand and smearing onto the rocks. They also excel in soft, wet conditions. The tread on the Rock Razor is very low in the center. A four-three lineup of low profile square knobs means that the tire rolls fast, but on the shoulder there are reasonably big, burly cornering knobs for committed turning. 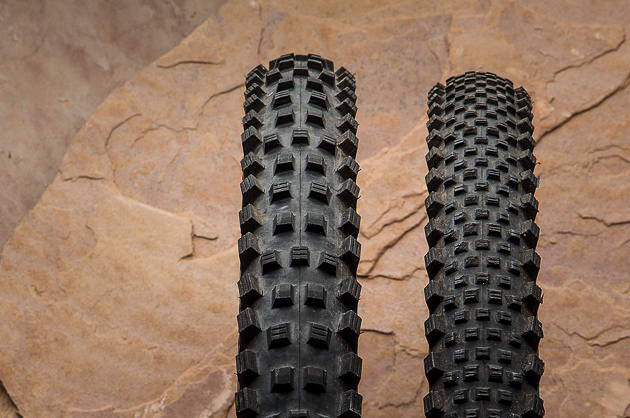 On the trail, the lack of rolling resistance is noticeable and the high-volume carcass provides a lot of cushioning and surprising amounts of traction. The rubber boots for Mavic's Crossmax Enduro wheelset are, like the wheels, front- and rear-specific. The Charge is a chunky 2.4-inch tire intended for the front with large ramped center knobs and tall, siped cornering knobs on the shoulder of the carcass. The Charge has Mavic's softest Super Contact Compound, which smears and clings onto the trail incredibly well. 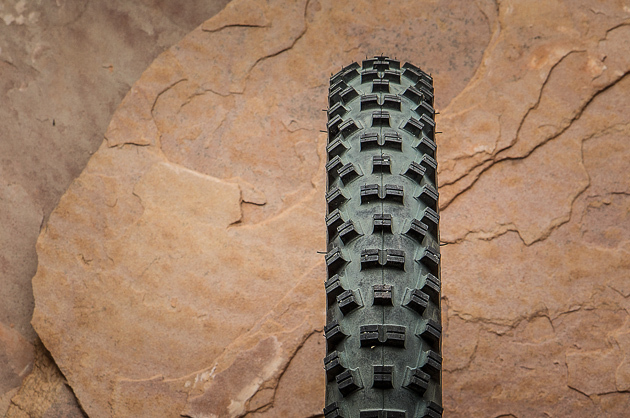 The narrower 2.3, rear-specific Roam XL incorporates smaller tread blocks. The tightly packed, dual-compound chevron pattern has a harder rubber on the center, which is designed to keep the tire rolling fast and give it a longer life. 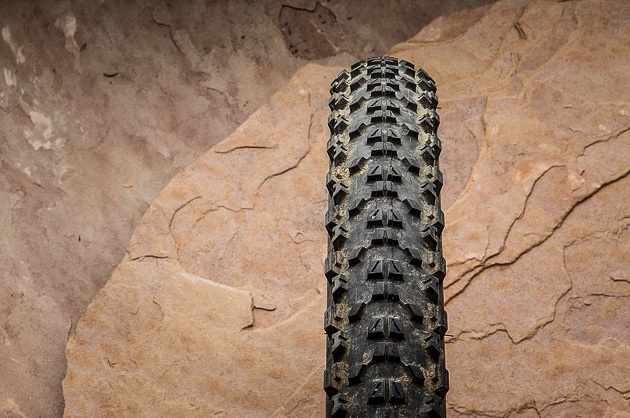 On the dry and sandy Sedona trails this tire whipped along, providing plenty of traction and a predictable breakaway point. On previous outings, our testers have found the Roam XL tends to pack up in very wet conditions. Rather than single-ply construction with reinforcement in just the sidewalls, both the Charge and Roam XL feature a full 2-ply casing. This makes them heavier, but also burlier. Between this and the ability to run the tires tubeless with sealant, we were able to run lower pressures to improve grip and provide damping, but still resist flatting the narrow rear tire. 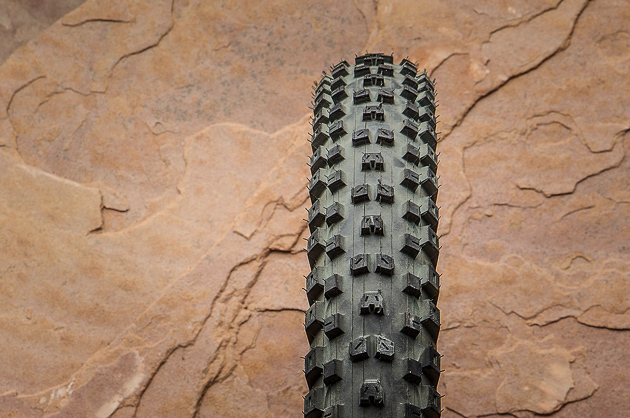 The Ardent 2.4 29er is one of the most underrated tires on the market. 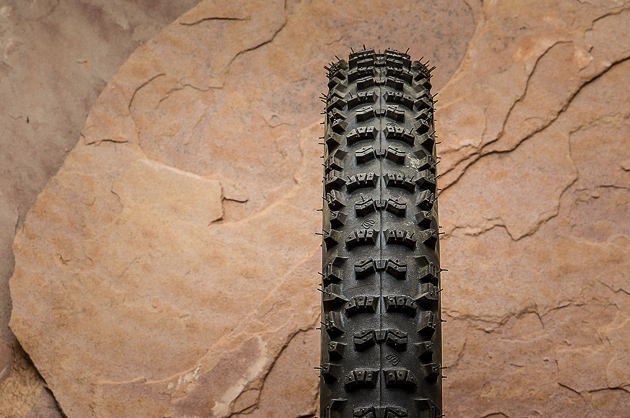 If you've tried Maxxis' 2.2 version, you may think the Ardent is nothing special. Opt for this 2.4-inch version, however, and it'll be a different story. The fat casing lends an amazing degree of forgiveness to whichever bike you're riding and the shoulder knobs hook up under hard cornering in ways that its skinnier twin can't match. Where does the Ardent 2.4 excel? It's a good all-rounder with reasonably low rolling resistance, but considerably more grip than you'll find in most 29er tires. It's an excellent choice for someone who wants to add a bit of confidence and grip to a wagon wheeler. It's also available in 26- and 27.5-inch versions. I run this thing on cross-country and all-mountain bikes alike. I've ridden the Ardent 2.4 in the snow, mud and in dusty, dry conditions. It's solid everywhere. Not mind-blowing great, but if tires could be rated on a one-to-10 scale, this Ardent is a solid eight everywhere. 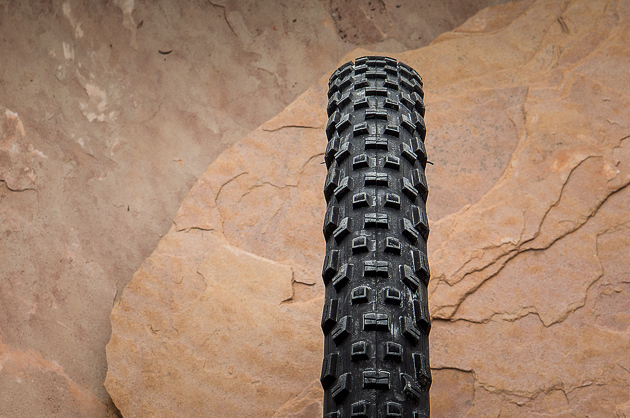 It's been a while since I've been stoked on a WTB tire, but the Vigilante is seriously good. It only comes in a 2.3, but in all three wheel sizes, with two casings and rubber compounds. We wanted the Team Issue tire, which offers a reinforced casing and softer rubber, but they weren't available yet. The regular Vigilante still impresses, though. It has the same knob pattern, which excels in most conditions. The siped, square knobs are tall and widely spaced, equating to gobs of traction. WTB utilizes a dual-compound rubber on this model, which is harder at the center for better rolling and wear, and softer at the edges for cornering traction. It's not the fastest tire out there, but it's no slouch either.